Thanks to Sarah for finding these scans from Susan from Fishbiscuitland. This entry was posted in Uncategorized and tagged Magazines on December 21, 2018 by admin. In a recent article Yunjin Kim responded to a question with the following answer. Is this the first time that we’ve had confirmation that Paik and Hanso were connected? 1) What do you find the most challenging aspect of performing the flash-forward scenes? The most challenging aspect is not knowing the whole storyline. I’m left to fill in a lot of blanks. For example, what happened to Sun when she finally returned to Korea? We know she delivered her baby, Ji Yeon, but how did she find out her father, Mr. Paik, is seemingly connected to the Hanso Foundation? And there so many more … I’m left guessing a lot of these things on my own and hope for the best. 2) Can you offer some teasers/hints about the Oceanic 6’s great escape? Without giving too much away … I have to say the Oceanic 6’s great escape feels like it was inevitable. A lot of events occurred, some heroic sacrifices, fortunate accidents, fate, but most importantly, love saved them. 3) If you could ask the writers for one thing in Season 5 for your character, what would it be? This entry was posted in Uncategorized and tagged Hanso, Interviews, Paik, Yunjin Kim on December 18, 2018 by admin. Thanks to Stefan for the following. HOLLYWOOD — Four seasons of helping his friends survive Lost’s mysterious island has softened old James “Sawyer” Ford, a former con artist who was recently seen cradling Claire’s baby boy. As the show closes in on Thursday’s two-hour season finale (ABC, 9 p.m. ET/PT), emotions run high as Sawyer (Josh Holloway) and company endure a series of game-changing events. 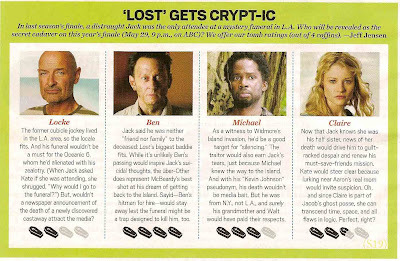 Flash-forwards have indicated that Jack, Kate, Hurley, Sayid, Sun and baby Aaron (the so-called Oceanic Six) escape the island. The fates of all the others are unknown. Why would Sawyer choose such uncertainty? Those deep feelings for Kate (Evangeline Lilly) come into play as he is presented with the possibility of losing her forever. “That is a very important part of the finale that I can’t talk about,” he says. Like his character, Holloway has experienced his own evolution. Being away from L.A. these past four years has allowed him the opportunity to clear his head of insecurities that, he concedes, “were really eating at my soul.” Those insecurities were replaced with feelings of entitlement once he hit it big. But now he has settled into a comfortable mid-way point of peace, self respect and confidence — life lessons he now hopes to pass onto a child. From the top of the canyon, hikers are awarded a breathtaking view of both the Hollywood sign and the city itself. Along a trail, the actor is recognized by two student filmmakers who ask if he wouldn’t mind making a cameo in a short film they are shooting. He can’t say yes, of course, and politely explains his agents’ role. “I dig you, man,” he tells one of them. Holloway can’t help but be reminded of his own years struggling to make it as an actor in L.A. before Lost catapulted him to stardom. When the show ends in 2010, he says, “we’ll probably get us a little place here because the biz is here, and I want to stay in it.” But he will also spend time at his home in the Colorado Rockies and the Hawaiian beach house he intends to maintain as a rental. For Holloway, that means taking chances. Four years later, he is allowing himself to be photographed as the face of Cool Water cologne, replacing pro surfer Laird Hamilton. Promotional images depicting Holloway cliff-diving in China have appeared in Europe over the past two years, but only now is he making a splash in American markets. Preparing for a future, he is finally taking seriously the production company he formed primarily for tax reasons. “I have all these ideas for shows — from reality, to writing, to directing,” he says, clearly excited. He recently wrote two comedy skits he’d love to perform as a guest host on Saturday Night Live. Beyond that, he and Yessica are discussing opening a day spa. Perhaps offering a hands-on deep tissue massage from Sawyer himself? This entry was posted in Uncategorized and tagged Interviews, Josh Holloway, There's No Place Like Home, Video on December 17, 2018 by admin. Ausiello: The significant death I hinted in the last AA? It’s for sure an original cast member. This just in: Better make that (gulp) three original cast members. That’s right, per my Lost mole, a trio of island vets won’t survive tomorrow’s finale. Crikey! This entry was posted in Uncategorized and tagged Ask Ausiello, Death, There's No Place Like Home on December 16, 2018 by admin. Thanks to Freckles from Lost-Chile for the scans. This entry was posted in Uncategorized and tagged Magazines, There's No Place Like Home on December 15, 2018 by admin. Thanks to Lauren for the heads up on this new article from TV Guide. Say what you will about wily Ben Linus, but Michael Emerson is one of Lost’s most interesting cast member interviews. Maybe it’s the way he searches for just the right words — always cryptic, yet sometimes telling. On the eve of the conclusion of the ABC serial’s season finale, I decided to kick off a two-parter of my own. Here, Emerson talks of Ben’s fractured bond with the island, names the other (Other?) character that makes his “mouth water,” and chimes in on a tale of two Emilys. TVGuide.com: Give me three words to describe the season finale. Michael Emerson: [Thinks] Dark. Violent. Casualties. TVGuide.com: About a year ago, you and I spoke about how Ben was loath to ever leave the island. And yet we’ve now seen that it is something that does happen. What do you think changed there? Ben’s attachment to the island was… provisional. He’s always been able to leave it. But now there’s some question of him maybe having to abandon it – and that’s as a result of developments in this last season. TVGuide.com: So it’s always been there as an option, but it’s only recently that he has chosen to avail himself of it. I think so, yes. Things have gone so… wrong. Events have forced his hand in a number of ways. And John Locke appears to have been “anointed” somehow. TVGuide.com: Ben appears to be making some sort of peace with that shift. Yes. His gut reaction is that of a teenage boy, which is to be vengeful and full of rage and bitterness. But eventually, he will always play the board as it is in front of him. He will accept the terms. TVGuide.com: When you first were pitched this role, did they give you any hint as to the scope of Ben’s involvement in the mythology? No. I doubt if they even knew it at that time! As far as I knew, it was to be three episodes. I think it was an experiment, one that worked out happily. Yeah… And he’s a great character. It makes my mouth water to think what they could do with Richard Alpert. TVGuide.com: The guy is just flitting around time no worse for the wear, no nose bleeds…. Right, and he’s just one of the eeriest characters. TVGuide.com: You received an Emmy nod last year for Lost. Does an actor ever settle into a part and think, “You know what? This could be an award-winning role, if I do the right things with it”? TVGuide.com: And with a dark role that doesn’t always connect with Emmy panels. And we work in such isolation, too. That’s a contributing factor. We’re out there in Hawaii, there are no paparazzi, there are no fancy parties…. We get up before the sun, drive to some remote location, and punish ourselves all day long. You don’t get a strong grasp as to how it’s received on the rest of the globe. TVGuide.com: Are we to make anything of the fact that both Ben’s mother and Locke’s mother were named Emily? This entry was posted in Uncategorized and tagged Interviews, Michael Emerson, There's No Place Like Home, TV Guide on December 14, 2018 by admin. This entry was posted in Uncategorized and tagged Interviews, Kevin Durand on December 13, 2018 by admin.